Pest description and crop damage Medium to small greenish aphids that feed on leaves (primarily filbert aphid) and husks (primarily hazelnut aphid), causing honeydew. Experimental evidence indicates that heavy infestations of aphids should be controlled to prevent reduced fill and smaller nut size. Damage caused by aphids is cumulative; benefits might not be seen during the first season of treatment but become evident after two years or more of aphid control. Biology and life history The aphid overwinters as eggs on twigs. In early spring, eggs hatch, and the aphids feed on buds before moving to the leaves. The population can increase rapidly, and there are many generations per year. In the fall, sexual forms are produced which lay overwintering eggs. Pest monitoring The sampling period is April 1- Sept 30. Check three terminal branches per tree and three leaves per terminal. Count the number of aphids per leaf and treat when the following thresholds are reached: April: 20/leaf, May: 30/leaf, June: 40/leaf, and July: 40/leaf with an increasing population. If there are signs of the parasitoid, Trioxys pallidus, hold off on treatment and check back on population levels in a week. Mummified aphids indicate that the parasitoid is active. The mummies appear swollen, rounded and darker and may have an exit hole chewed by the wasp. An introduced parasitoid wasp (Trioxys pallidus) targeting this aphid has become well established in the Willamette Valley. 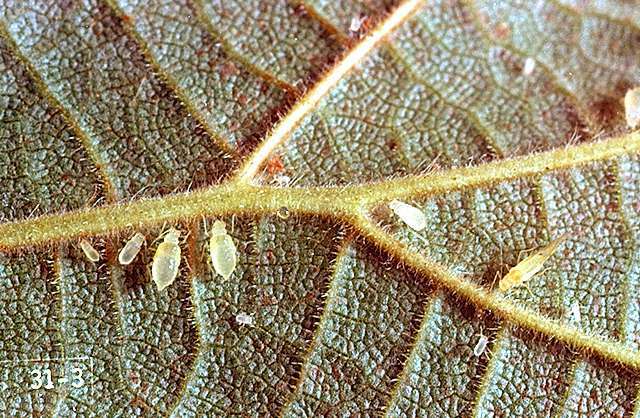 This biological control makes aphid sprays unnecessary in many hazelnut orchards. Pest management that is detrimental to the wasp population can aggravate aphid problems. Note also that broad-spectrum insecticide applications made against other pests can free the aphid from biological control and cause population outbreaks. Aphid populations tend to be higher in plants that are fertilized liberally with nitrogen. Home orchardists: Wash aphids from plants with a strong stream of water or by hand-wiping. Avoid excessive watering which, together with nitrogen applications, produces flushes of succulent growth. Control ants, which "farm" the aphids for their honeydew and protect them from predators. acetamiprid-Do not make more than one application a year. PHI 7 days. kaolin-Some formulations are OMRI-listed for organic use. plant-derived essential oils-Some formulations are OMRI-listed for organic use and have shown efficacy against aphids. acetamiprid (Assail 70WP) at 0.57 to 1.0 oz/100 gal water (2.3 to 4.1 oz/a). PHI 14 days. REI 12 hr. No more than 4 applications per season. Lorsban 75WG at 2 to 2.67 lb/a. PHI 14 days. REI 1 day. No more than three applications per season. Do not graze livestock in the treated area. Extremely toxic to fish. Toxic to birds and wildlife. Lorsban 4E at 3 to 4 pints/a. PHI 14 days. REI 1 day. No more than three applications per season. Do not graze livestock in the treated area. Extremely toxic to fish. Toxic to birds and wildlife. chlorpyrifos/gamma-cyhalothrin (Cobalt) at 6.5 to 14.2 oz/100 gal (26 to 57 fl oz/a). PHI 14 days. REI 1 day. Do not make more than 3 applications per season of Cobalt or other product containing chlorpyrifos for hazelnuts. clothianidin (Belay) at 3 to 6 oz/100 gal water. Use the low rate for smaller infestations or smaller trees. Apply no more than 0.2 lb a.i/acre per year. diazinon (Diazinon AG 500) at 1 pint/250 to 400 gal water/a. No more than one application per season. PHI 45 days. REI 18 days. Washington and Oregon only. flupyradifurone (Sivanto) at 7.0 to 10.5 fl oz/a. PHI 7 days. REI 4 hr. Use no more than 28 fl oz/acre/year. imidacloprid (Provado 1.6, Admire Pro, generics) at 3.4 to 7 fl oz/a. PHI 7 days. REI 12 hr. Generic labels for imidacloprid are available. imidacloprid/beta-cyfluthrin (Leverage 360) at 2.8 oz/a. PHI 14 days. REI 12 hr. imidacloprid/cyfluthrin (Leverage 2.7) at 3.8 to 5.1 oz/a. PHI 14 days. REI 12 hr. spirotetramat (Movento) at 6 to 9 fl oz/a. PHI 7 days. REI 1 day. sulfoxaflor (Closer SC) at 1.5 to 2.75 oz/a. PHI 7 days.